Turns out paying people to buy cars isn’t a great policy for the economy or the environment. That’s the determination of a pair of Brookings Institution researchers who evaluated the effectiveness of the 2009 Cash for Clunkers program. The $2.85 billion program, part of President Obama’s economic stimulus package, produced only 2,050 “job-years,” according to researchers Ted Gayer and Emily Parker. That means every year of employment attributed to it cost taxpayers about $1.4 million — a far worse cost-benefit ratio than many other stimulus programs. Between June and September 2009, about 700,000 people took advantage of the program known formally as the Car Allowance Rebate System (get it?). The federal government gave each participant a rebate between $3,500 and $4,500, depending on the estimated emissions reduction compared to the purchaser’s previous car. New vehicles purchased averaged about 25 miles per gallon, compared to an average of about 16 m.p.g. for trade-ins. However, Brookings determined that of these sales, only about 380,000 were a direct result of the program; the other 320,000 participants would have purchased cars during that time period anyway. And even many of the stimulated sales would have occurred during the following months without any subsidy, researchers determined. “The net result was a negligible increase in GDP, shifting roughly $2 billion into the third quarter of 2009 from the subsequent two quarters,” said Gayer and Parker. Cash for Clunkers’ environmental returns were less than stellar as well. The program resulted in reduced carbon emissions of between 9 and 28 million tons, at a cost of $91 to $301 per ton. “The cost per ton of carbon dioxide reduced by the CARS program far exceeds the estimated social cost of carbon, suggesting it is an inefficient approach to reducing emissions,” Gayer and Parker write. The cap-and-trade proposal rejected by the Senate in 2009 would have been far more meaningful, they add. Cash for Clunkers produced similar environmental returns to the electric vehicle subsidy — which, we’ve reported before, is not such a great use of tax dollars either. At the time Cash for Clunkers passed, Washington failed to enact a less-expensive, $2 billion proposal to help preserve transit service for millions of Americans. And this is news because why? Any economist could have told you back in 2010 what Brookings “published” in 2013 that the entire Cash for Clunkers was worthless from an economics point of view. But, I guess the spin on this one is…cars bad. Cars not good. For $1.4 million, you could just pay someone $35,000 a year for 40 years, which is probably close enough to what the average job pays! But that ignores the point of stimulus. You aren’t trying to employ someone 36 years from now. you are trying to employ them for the next few months to stop the viscous downward cycle decreased spending –> Job Loss –> decreased spending –> job loss. I don’t think it ignores the point. By giving money away, besides essentially creating a “job” which consists on receiving a paycheck, my proposal would surely stimulate spending and create secondary jobs. The recipient would suddenly have enough money to buy a new TV or pay for daycare! OK, it’s tongue in cheek. But I think by any measure, spending $1.4 million to create not even a job, but a “job-year”, is a tremendous failure no matter how you look at it. Sure, but you could just as easily employ 40 people for 1 year at $35,000 each. It is rather pertinent that it’s normal to waste money on cars even when there are most cost-effective options. Letting a clunker finish its life is probably more environmentally friendly than throwing it away prematurely. Cars are expensive to salvage too. Someone should do an article about when local agencies provide assistance to buy a car, drawing from transit operating funds. Just unconscionable. Unless the jobs created by a government jobs program are self-sustaining (i.e. the government gives seed money to start an industry which eventually turns a profit year after year) your approach makes more sense. This was a one-shot deal which at best created a temporary blip in demand for new cars, even though the long term demand is down. That being the case, it makes more sense to just send checks to people. This way you avoid the negative externalities of manufacturing more cars. If you take that into account, it wouldn’t surprise me if this program lost money overall. I’m not against government jump-starting industries but it should stick to those ones which have huge upside potentials. Car manufacture just isn’t one of those industries. 50 years ago it was very important to the economy. It no longer is. It will also continue to become less relevant. 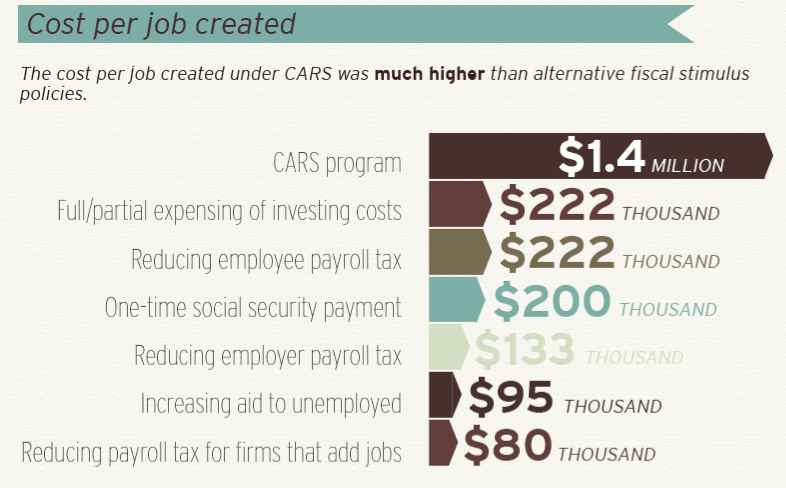 If the government wanted to help keep these auto manufacturing jobs, it would have invested heavily is rail transit while at the same time bankrolling the auto makers to retool a large part of their capacity for rail vehicles. At the time i think most people saw this for what it was… A car industry bailout. This analysis seems to be missing the point of the program – it was expensive for the amount of CO2 emissions it cut, it was expensive for the number of jobs it created, and it was expensive for the broader economic activity boost it made. But the point of the program was to do all three of these things, and prevent the American car industry from going under (which many people thought it would at that time frame). I think it’s perfectly reasonable to criticize the program, but one should be addressing all of its motivations, rather than just saying it wasn’t especially effective at some of the other motivations. at the time he wanted to keep the Acura. this was 2009 and the Acura was only 6 years old. the old Ford was on the verge of breaking down and that was the car he wanted to trade in for a cheapo daily rider to work and keep the acura for weekend driving in luxury. and in the end it was kind of dumb that a 6 year old car qualified and a 15 year old clunker didn’t for the credit. OK, but I mean why didn’t the Ford qualify? Huh, wow, what a strange rule. Thanks. Could Electric-Car Tax Credits Become the Next “Cash for Clunkers”?